The Radeon is one of the most important launched from TVS this year. The Radeon is aimed at the rural audience and one can see that by the design language of the bike. The bike is going to attempt to dethrone the Hero Splendor, one of the most important bikes in the Indian market. 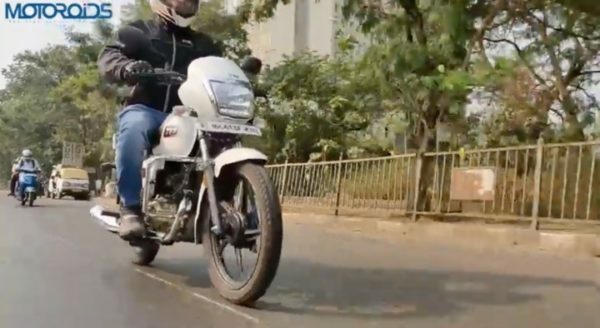 The bike is a proper commuter which is powered by a 110 cc motor and gets a 4-speed transmission. Here is our in-depth review of this bike, with a video at the end. Looking from at the side of the bike, one can see the design inspired by Splendor. If it is a mere coincidence or done on purpose, is something that only TVS can answer. The engine gets a golden finish at the bottom end, which goes well with certain colours. 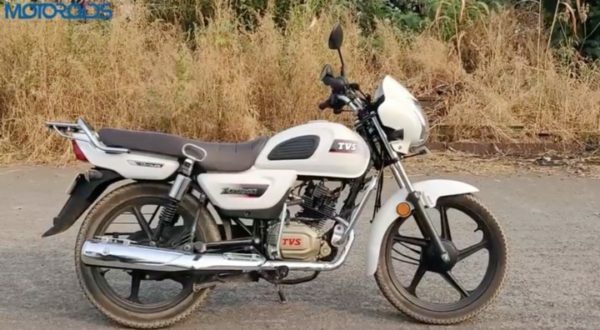 The TVS branding gets a red accent, this interesting play of colours make the engine stand out. There is a hook and grab handle for the pillion at the middle of the saddle. An extended carrier at the end of the saddle, which could be useful to hold luggage. There are no variants on offer, you get 5 spoke alloy wheels at both ends. Up-front is a headlight powered by a 55-watt bulb and surrounded by a beautiful chrome accent. You also get a LED DRL. The Radeon does not cheap out in equipment. You get an electric starter as standard, along with the standard kick starter. The instrument console, according to TVS, is inspired by a car. It gets a plethora of equipment, including a power/economy indicator. Other lights on the instrument console are a high beam indicator, side light indicator, side stand alarm and a service reminder. The bike has an alarm which buzzes until you take the side stand up, that alarm also buzzes to remind you to switch off the indicator. There also is a pass light and the LED DRL which was mentioned above. There also is a USB port at the front end which could come in quite handy. The 110 cc engine of the Radeon generates 8.4 PS and a class-leading 8.7 Nm of torque which does a decent job. 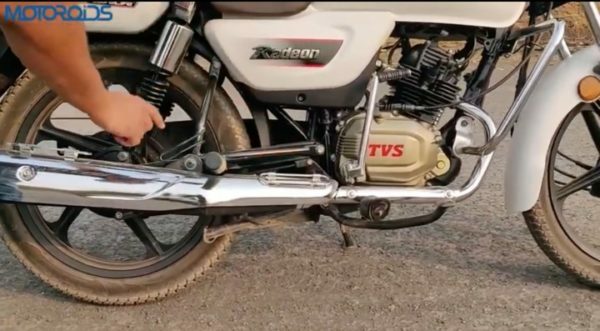 The 4-speed gearbox is very nice and the low-end torque enables the rider to ride comfortably in high gears at low speeds. The suspension is on the softer side which gives the bike a very comfortable ride. The brakes on the bike are drum units on both ends, while we would have loved the option of a front disc brake, the bike gets a combined braking system. Due to the synchronised system, riders who just use the rear brake will be benefitted as the pedal will engage both the brakes. The fuel efficiency of the bike is about 60-65 kmpl. So what is the final verdict on the bike? At INR 48,400 (Ex-Showroom, Delhi) this bike offers some serious bang for its buck. 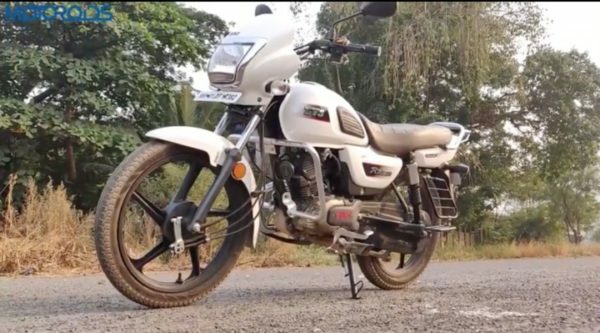 Its immediate rivals are the Hero Splendor, Bajaj Platina and Honda CD Dream in the Indian market. The TVS offers a perfect blend of comfort and style at a very attractive price point. Do watch our video on this brilliant package linked below.